I have a soft spot for wreaths. I think it’s their welcoming nature. Something about a wreath just makes you feel at home. Don’t you think. 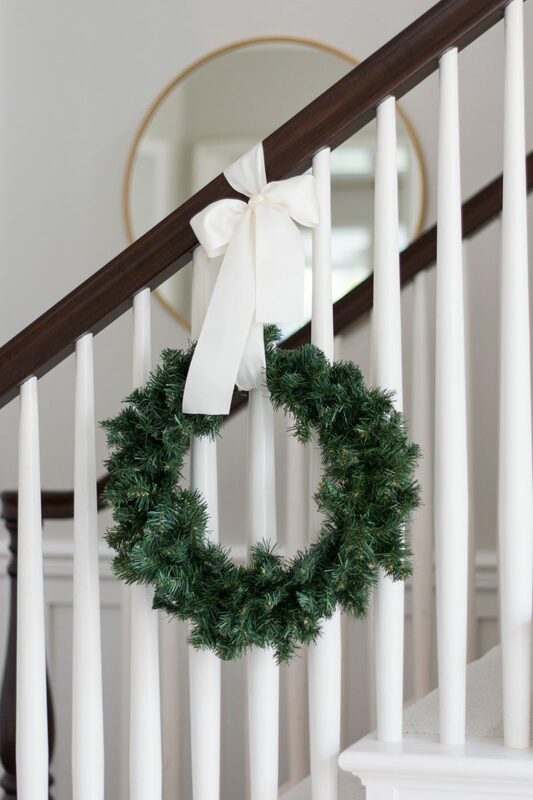 This Christmas season we opted for wreaths instead of garland on our stairs and I’ll be sharing how we got them to stay put. It took a minute to figure it out so I thought you might like the tip. A little bit of holiday inspiration, too. Last year we hung a fresh wreath above our bed. Trader Joe’s always has them for $10. I love having the smell above our bed. We will do the same thing this year. (The pillows are from HomeGoods). We also hung wreaths on all of the front windows of the house. 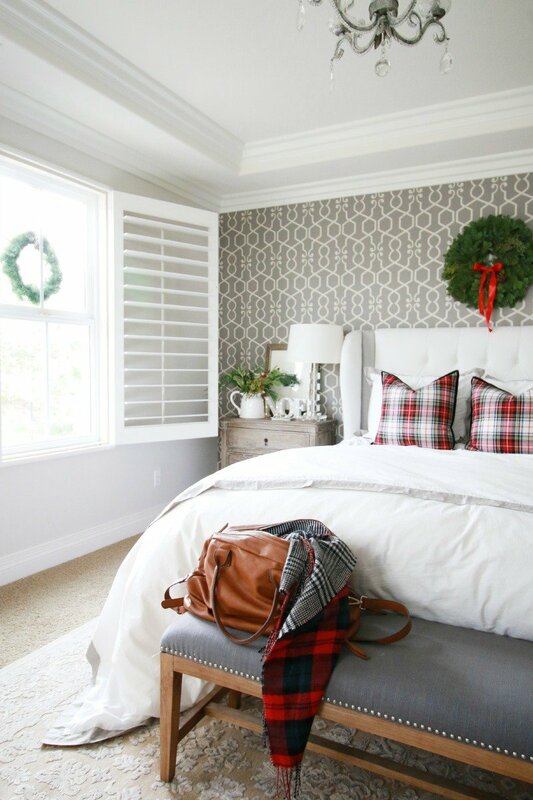 You can see more of this bedroom here and the entire Christmas tour here. My heart skipped a beat when I saw this wreath. I just can’t believe how gorgeous this is. Everything about this. Rachel is so so talented. 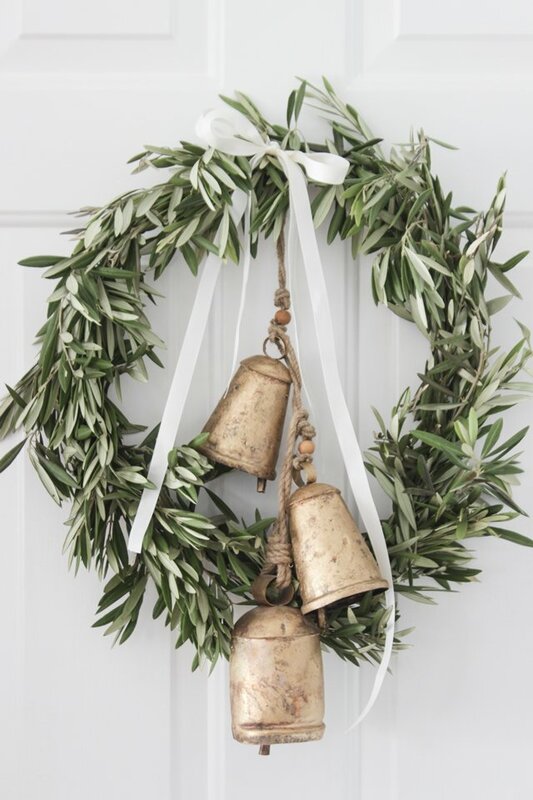 I adore not only the olive branches but the beautiful patina on the wreaths, too. So charming and utterly perfect. Kelly knocked it out of the ballpark in her kitchen. How perfectly lovely is this? 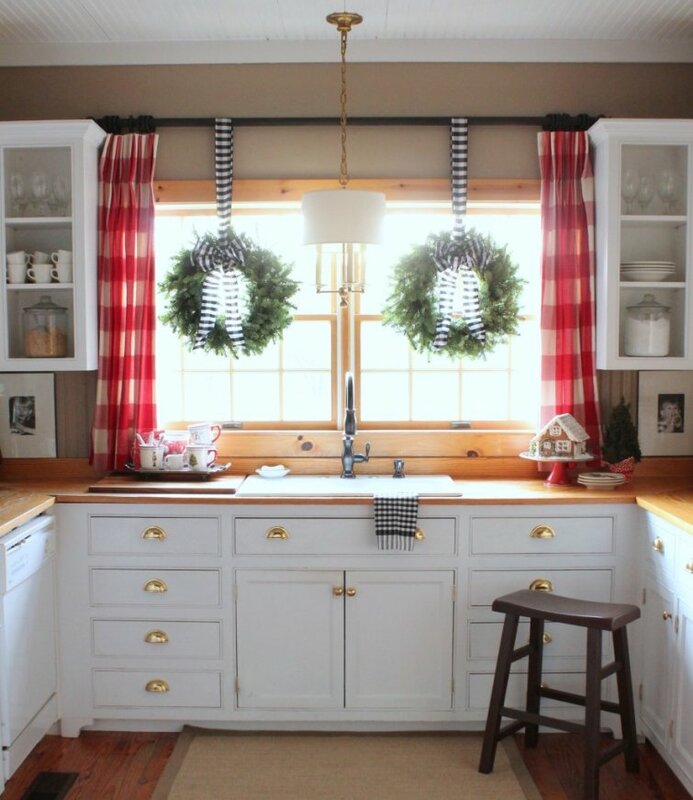 It oozes charm and I just adore the wreaths hanging from the curtain rod. And don’t get me started on the buffalo check. I am a sucker for a great boxwood wreath, too. So pretty and simple. We have one on our front door and a couple in the house. Last year I opted for fresh garland from Trader Joe’s and buffalo checked ribbon from Michaels. I loved everything about it. We got lucky and it did last a few weeks. At one point I gave it a bath to add moisture back into the branches ( crazy, but it worked). Our banister was smaller and it only took two garlands. We thought we would switch things up this year. 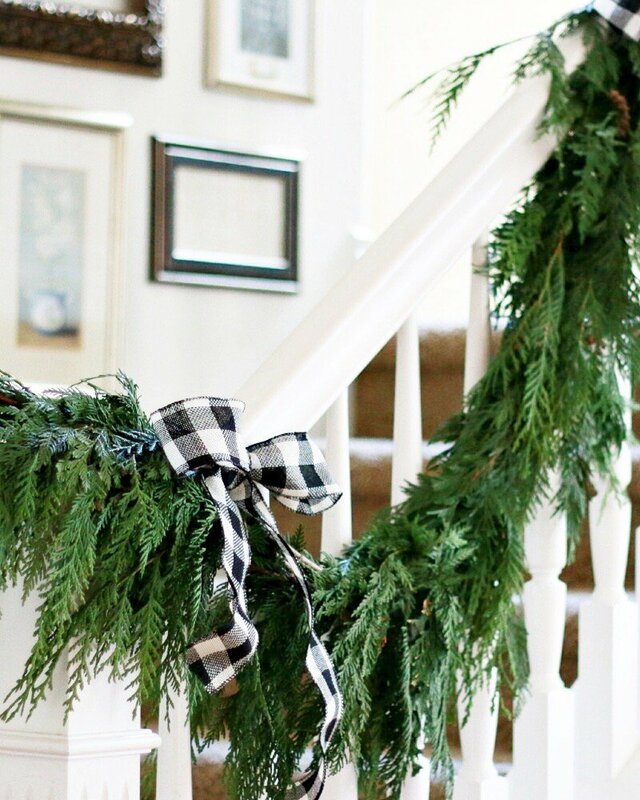 Last year, I hung wreaths on my sister’s banister for the Dream Tree Challenge. I fell in love with the look then and knew it would be a fun thing to try in this house. I may swap them out for boxwood wreaths. I am still undecided on if I want to spend the money. But for now we are really enjoying this little touch of Christmas. They are tricky to tie as they like to slip down the banister so I made this short video so you can see how I did it. A bit hard to explain without seeing. I hope the video was helpful. I realized it would have been much more difficult to try to explain how that all worked. Very easy and very quick. Let me know if you try this! I hope you’re enjoying the week so far. I am having coffee with a dear friend this morning. Trying very hard to focus on the relationships and quality time in my life. Great way to start the morning. I talked a bit about having friends over in this post. Keeping is short and sweet is the key! 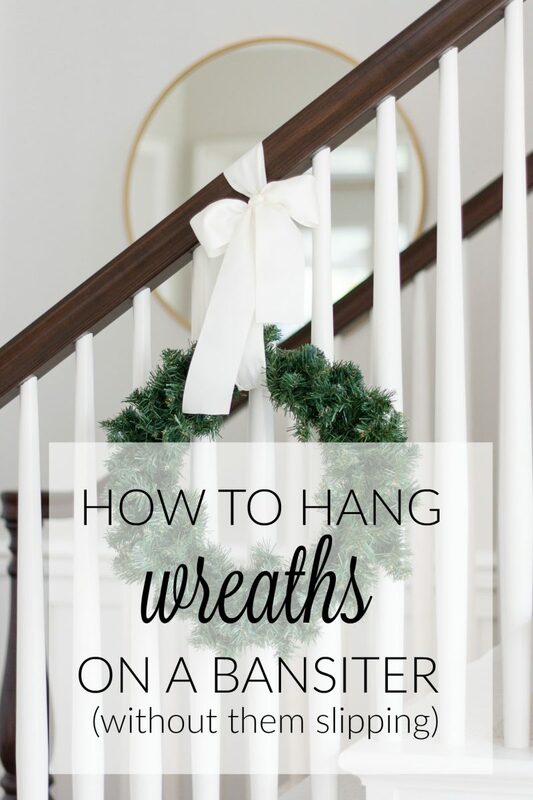 To “Five Ways” post on how to incorporate wreaths in your own home go here. Another fun way to hang them on your staircase! The wreaths are a wonderful idea. I love your tutorial also. So pretty Courtney. We use pipe cleaners that look like greenery, if that makes sense, as we have larger bows just on the tops of the wreaths. Great video–so helpful! My 9 year old is going to help me do this tonight. So fun! I love wreaths, too. Those look so pretty Courtney with the ivory satin ribbon. Simple and elegant. Your video tutorial is very helpful!